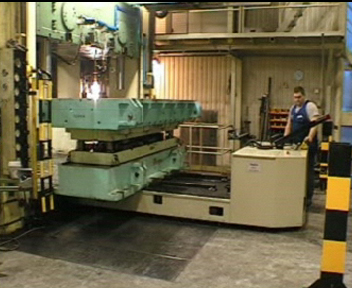 The Die Change Cart WWF version "Front Loader with short Lifting Stroke" pushes the press die to the front, down from its die platform onto the press table. Reverse it pulls the press die down from the press table, crossing the front side of the Die Change Cart WWF, onto its die platform. The sliding mechanism with which the press die is pushed or pulled, usually is driven by hydraulic cylinders. This sliding mechanism is integrated into the die platform of the Die Change Cart WWF. The Die Change Cart WWF, version "Frontloader with short Lifting Stroke", has a hydraulic lifting installation, which lifts the die platform of the die change cart up to the level of the press table. This enables to push the press die onto the press table and revers to pull the press die out of the press onto the die change cart. The lifting stroke is about 250 to 300 mm. The height of the die change cart standing in position "die platform down" as well as the maximum lifting stroke of the die platform are defined basing on the press table heights of the presses, at which the press dies are foreseen to be changed by the Die Change Cart WWF. In case of several presses this height often is different. In such a case the lifting stroke of the Die Change Cart WWF is defined in such a way that the cart will be fitting to all presses to be considered. The Die Change Cart WWF is much more manoeuvrable than a comparable forklift truck, as it picks up the load between its front legs and the rear steering- and drive wheel and not in front of the cart. Therefore it does not need any counterweight and therefore it is shorter than a comparable forklift truck. In case that you are thinking about changing your die change procedure to die change by Die Change Cart, we should exchange corresponding data. Then we will be prepared to provide you with an interesting offer.